A MAN WHO was arrested on suspicion of money laundering after €120,000 was seized in Dublin has been released. 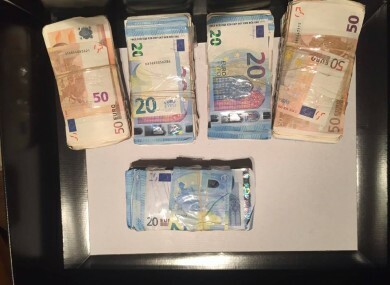 The money was found following a number of intelligence led searches in Islandbridge and Ballyfermot yesterday. The man, aged in his 30s, was earlier questioned at Kilmainham Garda Station. The operation was part of an ongoing investigation targeting serious criminal activity in the Dublin region. The searches were carried out by gardaí from the Garda National Drugs & Organised Crime Bureau supported by the Special Crime Task Force. Email “Man arrested on suspicion of money laundering has been released ”. Feedback on “Man arrested on suspicion of money laundering has been released ”.